With an IPX4 splash-proof rating, the Gemini MPA-2400 weather-resistant trolley speaker is perfectly suited for outdoor use. Thanks to its built-in rechargeable battery, you can keep your music going off the grid without the constraints of power outlets. What makes this speaker truly exceptional is its portability. It has an integrated, retractable trolley and carrying handle for easy transportation. The DSP EQ Presets take the guesswork out of customizing your sound. 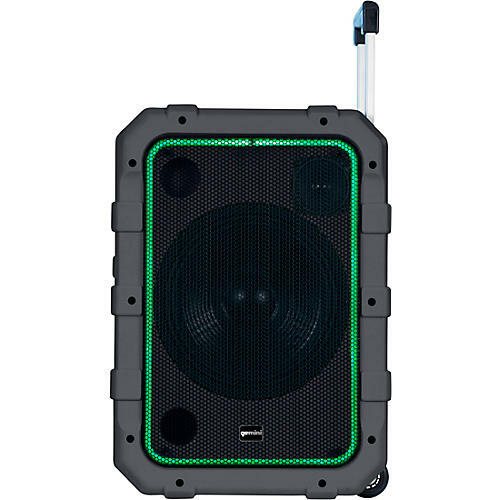 To get the party started you can count on exciting multi-colored lighting to spice up your performance and the Mic Echo effect gives your performance that professional sound. Built-in USB Media Player – All you need is a flash drive and some music or you can stream music wirelessly from your smartphone or tablet. This speaker can be controlled with the included remote. FM Radio for your favorite music, sports and new stations.